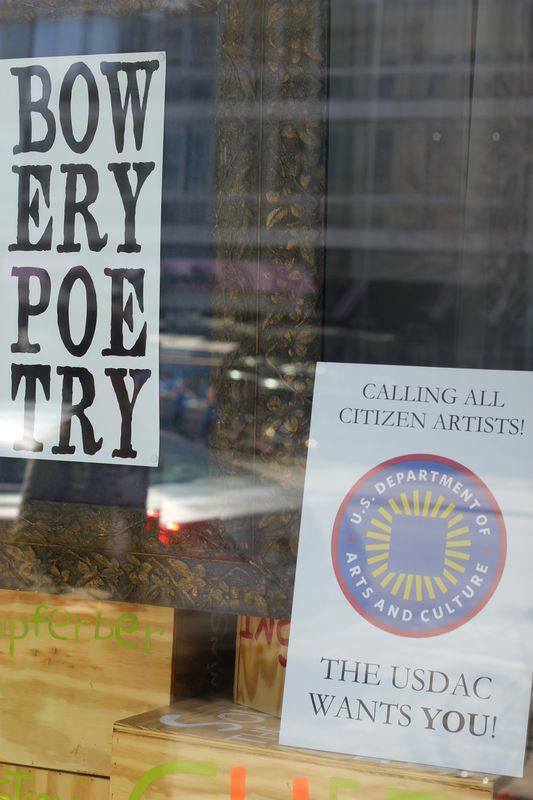 Though it has no central office, the U.S. Department of Arts and Culture will be setting up pop-up headquarters at the Bowery Poetry Club in NYC on Saturdays April 12, 19, and 26. Known as the USDAC Café this will be informal space to meet, mingle, share, collaborate, and help spark a grassroots movement that harnesses the power of art and culture to cultivate empathy, equity, and social change! From 12:30-1:30pm the space will be open for all kinds of conversations and meetings of minds. From 1:30-2:30 there will be an Open (Project) Mic where participants can perform and/or share the project they’re working on. Each afternoon will also feature pop-up performances, a barter board, and break-out conversations. Lots of possibility; no panel. Anyone working on a creative project aimed at making the world a more just and sustainable place is invited to come share at the USDAC Café. Set up a table. Hold “office hours.” Make connections. Find collaborators. If you would like to have a table for your project or present in some form please write to usdac.us@gmail.com with a brief description of your project and your preferred dates of participation. More details can be found here.